Tidewater Striders – "We've run Hampton Roads since 1972"
Volunteer Now – Use our Online Sign up to assist with various opportunities throughout the year. Don’t forget to Like the Official Tidewater Striders Facebook page! 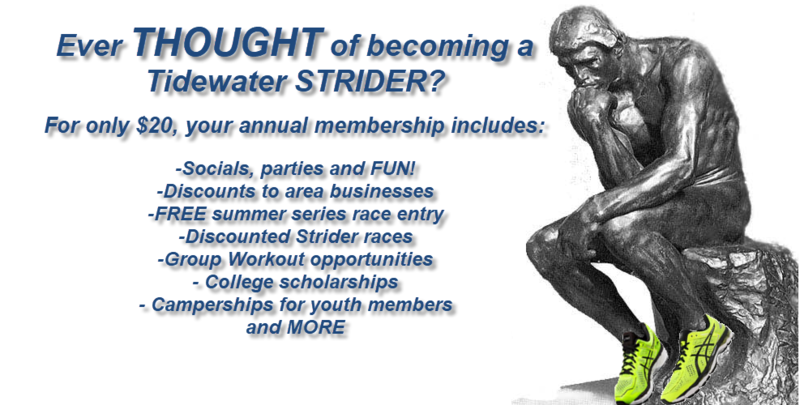 Follow The Tidewater Striders on Twitter! Visit the Race Schedule for full event details! May 5th – Adopt-A-Highway – VOLUNTEERS NEEDED to help CLEAN UP the stretch of SHORE DRIVE- PARTY/SOCIAL AFTERWARDS. Visit Club Happenings for full Adopt-a-Trail and Adopt-a-Highway details! Sneak Peak at the ERR Kids mile Trophy and the 1st Place overall and Masters 10k Trophy. ERR medals have arrived. Sign up today to earn one.